Theresa is a single who had gotten used to things the way they were. Her interest was in making her small kitchen more functional. The process took about 4 hours. 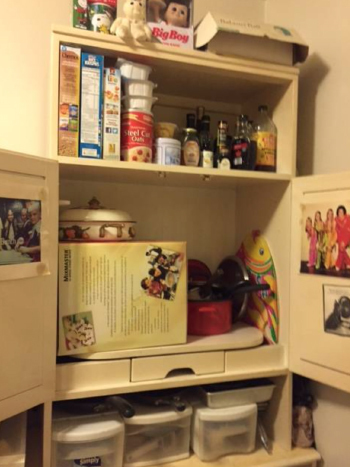 Her cupboards were filled with food items. I had her check for expired dates as well as food items she no longer wanted or needed for cooking or eating. She filled 4 large black garbage bags of old food. 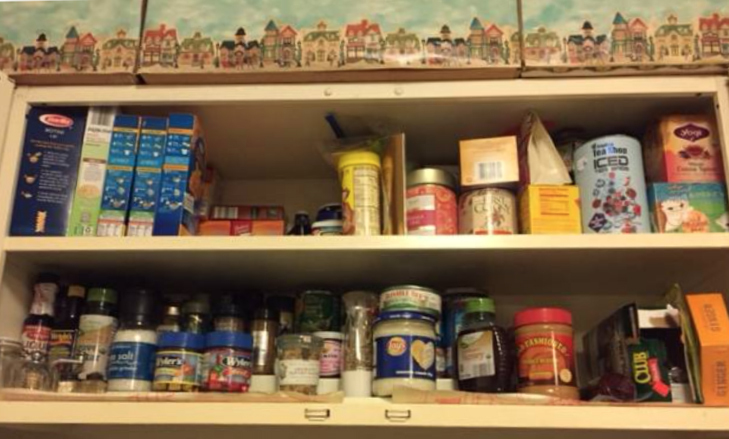 While Theresa was doing that, I sorted other pantry items into shoe boxes she had saved for the organizing session so food items could put them back in the finished cupboards by category. 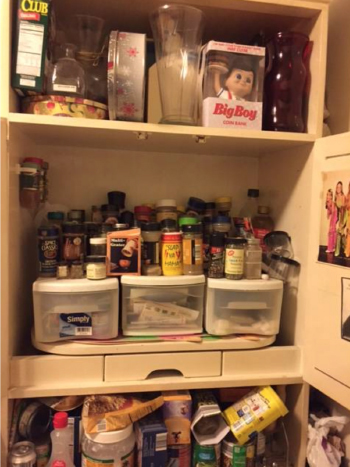 We relocated all the spices in the large cabinet to a tiered spice organizer in the smaller cabinet so Theresa could see everything she had. The reorganization got her excited about cooking more. We placed the plastic drawer organizers in the section below their original location where they fit the space perfectly and contained only utensils (ie. carrot peeler, can opener, measuring spoons, etc.) she currently uses, while the rest went into the donate bag or trash. Since it previously had no place to go, the large cookpot sitting in the box on the floor was then placed in the deep cupboard where the spices had been, and made use of the vertical height. We placed a uniquely shaped pot on top of the box that didn't have a proper home before. And put other saucepans in that space for easy access. Theresa felt her life was in much better order because of a cleaned out and functional kitchen.